The web server used by Cavendishgroup.co.uk is located in Great Britain and run by Gyron Internet Ltd. This web server runs a few other websites, mostly in the english language. 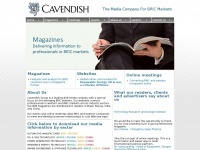 The websites of Cavendishgroup.co.uk are served by a Apache server. The content management system Drupal in the version 7 is used. The markup language of the website is XHTML+RDFa 1.0. The website does not specify details about the inclusion of its content in search engines. For this reason the content will be included by search engines.